This is our most far-reaching polar expedition and includes visits to three different locations. The sub-Antarctic island of South Georgia is home to a proliferation of unique wildlife and birdlife. There are penguin rookeries with more than 100,000 nesting birds and the beaches are covered in fur seals and elephant seals. Seabirds, including many of the albatross species call these islands home, nesting and raising their young in this wild and remote environment. South Georgia features a fascinating history and truly stunning scenery. 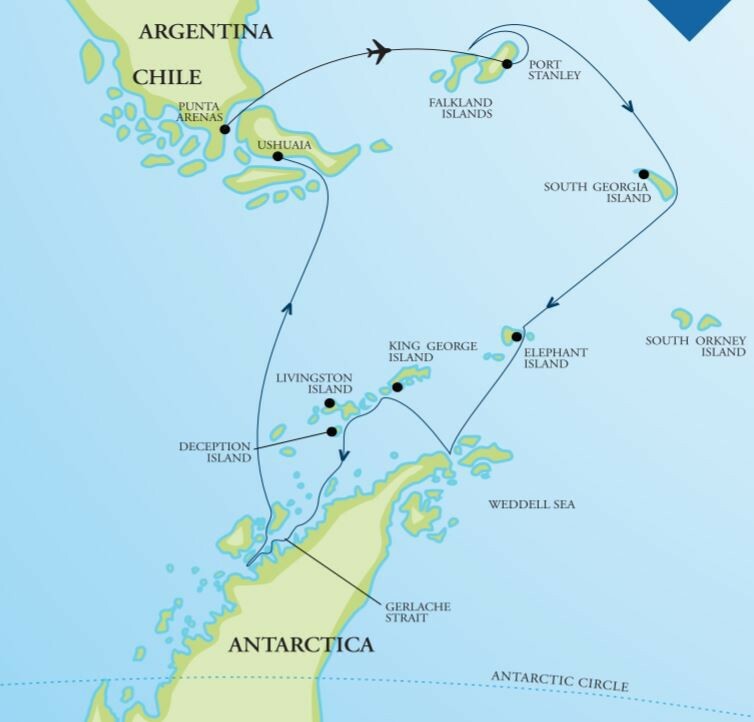 To the south lies Antarctica – the frozen continent and the second of our iconic destinations on this outstanding voyage. Icebergs in all shapes and sizes fill the waters, and yet more unique wildlife can be found living in sizable colonies. The waters are full of life and we frequently encounter whales including humpback, minke and orca. On this voyage, our days are spent exploring on shore in the company of expert guides – including naturalists, marine biologists, ornithologists and adventurers as well as our resident photography professional. Cruising in our inflatable Zodiac boats is another memorable activity. For the adventurers, we provide plenty of opportunities to explore on long hikes ashore, or by sea kayak. The clever use of a timesaving flight at the start of this voyage means you maximise your time in all the key locations. Overnight we have navigated across the north of the Falkland Island archipelago and today offers an incredible introduction to the wildlife of the Sub-Antarctic. Our plan is to explore the island of West Point and nearby Saunders Island. West Point is known for its rockhopper penguin rookeries and substantial nesting black-browed albatross colony. The opportunity to observe these spectacular birds in close proximity, and on the nest is an immense privilege and an experience not easily forgotten. Repositioning the ship, a visit to the wildlife-rich Saunders Island beckons. Along the white sand beaches and in the surrounding tussock grass we hope to encounter no less than four penguin species living in close quarters including gentoo, magellanic and rockhopper the impressive king penguin, with their colourful orange, gold and grey plumage. We depart the Falkland Islands tonight bound for South Georgia. Around 60 miles off the coast of the Antarctic mainland we find the South Shetland Island chain. Possible landing sites could include King George Island, Half Moon Island or Yankee Harbour. Weather conditions permitting we sail the ship into the flooded volcanic caldera of Deception Island. There are some outstanding hikes at these locations and the old whaling station and aircraft hangar at Deception Island beg for further exploration. After so much anticipation, we enter the icy waters of the Antarctic Peninsula in the vicinity of Mikkelson Harbour or Cierva Cove. Snow covered mountains soar from the dark waters. Along the shoreline in the bays and harbors of the Peninsula lives an incredible abundance of wildlife. Large rookeries are home to chinstrap, gentoo and Adelie penguins. Seals live on the ice floes, including the powerful leopard seal that we hope to encounter. Gulls, skuas and cormorants are also found nesting and feeding at many sites along the Antarctic Peninsula. We explore by Zodiac boat and on shore where a range of exciting activities await. Locations we hope to visit include Wilhelmina Bay, Orne Harbour, Cuverville Island and the Errera Channel. Join the photographic guide taking pictures of stunning icebergs. Or enjoy a hike to the top of a snowy mountain saddle with one of our adventure guides. If the opportunity presents itself, visit a science base or an old historic hut. The sea kayakers may paddle up to several miles from the ship, offering a truly memorable experience.